Earlier, my business partner and I were messing around with an experimental script to help with obtaining some faster search engine results from Google. What we were trying to do was find a way to quickly see the top one hundred results for a search query so we could parse the results and get what I was looking for much faster – but what we saw as far as Google search results seemed odd after running the script. You can click that for a larger image view. Now, if you are logged into Google, you can change the number of results Google displays on a single page. 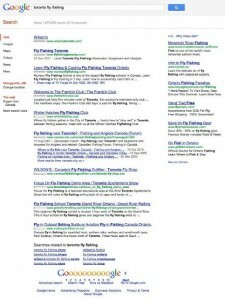 We wondered if there was an issue with our script, or was it a Google issue in how they displayed results, the more results that are being returned for a page. Guess what? Google does indeed change the rankings of the results when you opt to have more displayed. You might assume that by getting 100 results all at once, on a single results page would simply give you the same results you would get if you had 10 results per page, and then clicking through ten pages – but your assumption would be incorrect. Instead, Google seems to deliver the results when you select the higher quantity, by domain. Not by what it thinks is most relevant as you would assume if you were doing a conventional search with only ten results per page. Fly Fishing School Toronto Grand River… – www.grandriverrafting.ca/children_…..
What’s going on here? Is this what you would expect to see? When you select a higher number of results per page, Google seems to lump different URL’s on domains together in it’s results. But the end user is probably not expecting that kind of behavior. I would assume that most people that wanted to see more than ten results per page would want to see what Google is ranking on a page with longer results, but in the same order as if it were providing rankings to anyone looking at just ten results per page. In my opinion, it’s pretty flaky. Does Google think this is a feature, or is it a bug in the way it delivers search engine results? 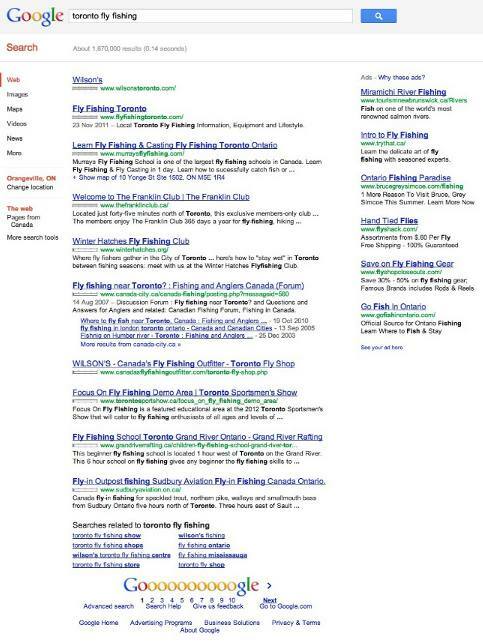 Does Google really think that if you are looking for 100 results for a query about [toronto fly fishing] that getting five results from flyfishingtoronto.com is more important than seeing murraysflyfishing.com and then thefranklinclub.com, where if you are only expecting ten results per page, the results would be quite a bit different? Maybe Google programmers have consciously done this in order to skew results for those that use rank tracking software and websites to purposely throw off results. I don’t know. I do know though, that if I am a Google user, and decide that I want to see more results than ten per page, I’m presented with a result that is quite a bit different. And it doesn’t really make sense as far as Google’s claims to be providing a good search experience. What are your thoughts? Google Bug, Feature, or Manipulation? Does it makes sense it to you? I hate that feature. it’s still not fixed, so apparently it’s not a bug. It does look like they earn money with it or so, it’s absolutely not in the interest for the users.